Retinoblastoma is a type of childhood cancer that develops in the light-sensitive lining of the eye, called the retina. The White Eye Detector or CRADLE (ComputeR Assisted Detector of LEukoria) cellphone app helps parents detect the appearance of white eye in pictures of their children. A white pupil can be a normal photographic effect in pictures (like red-eye, but white). Retinoblastoma can occur at any age but mainly occurs in children younger than 5 years of age and most often in those younger than 2. Retinoblastoma may occur in one or both eyes, but rarely spreads to other parts of the body. Although it is the most common eye tumour in children, it is a rare childhood cancer and accounts for about 3-4% of childhood cancers. Inherited: Retinoblastoma is sometimes inherited from the parent; this is known as hereditary or germline retinoblastoma and is usually bi-lateral (in both eyes). The main challenge of treating Retinoblastoma is the prevention of blindness, however approximately 98% of children with retinoblastoma are cured. Leukocoria, the medical term used to describe “The Glow” is an abnormal red-eye reflex, common to several devastating childhood eye diseases and is seen as a yellow “glow” in the pupil. Leukocoria actually means white pupil, and prompt attention by appropriate medical personnel is recommended if “The Glow” is seen in multiple photos. 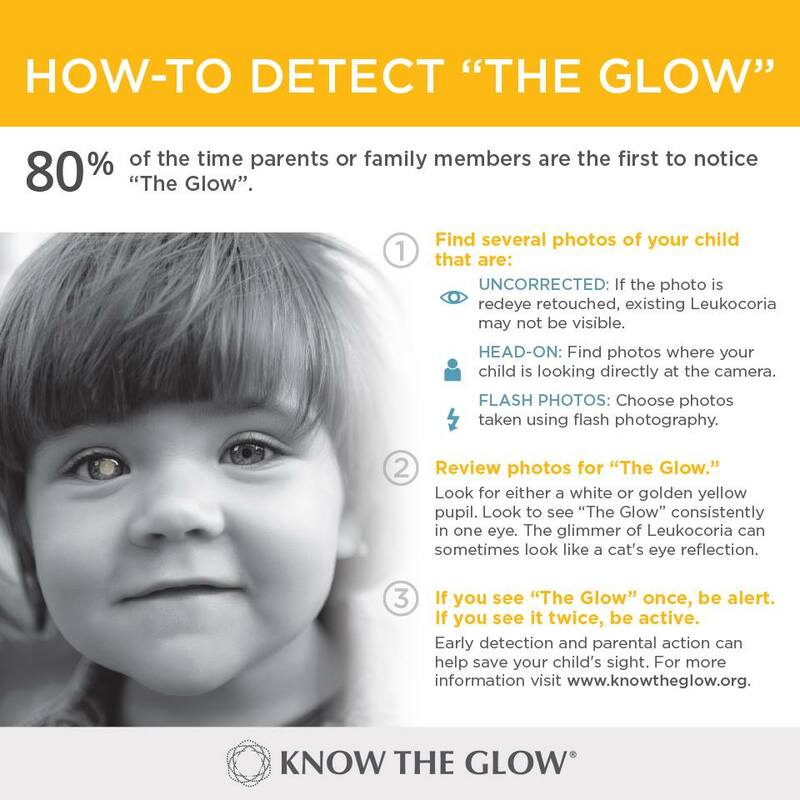 “The Glow” is an indicator of as many as 16 devastating childhood eye diseases, as well as the leading preventable cause of Amblyopia – monocular childhood blindness. Some of the diseases, such as nearsightedness, are correctable. Others are much more devastating but still preventable. Coats’ Disease, A rare eye disorder involving abnormal development of the blood vessels of the retina, which lines the back wall of the eye. As various components of blood leak into the retina, fluid accumulates under the retina. The result may be loss of vision, particularly central vision, and detachment of the retina from other layers of the eye. Retinoblastoma, A childhood cancer arising from immature retinal cells in one or both eyes and can strike from the time a child is in the womb up to 8 years of age. The app from Baylor University was invented by Baylor chemist Bryan Shaw and Baylor computer scientist Greg Hamerly. Shaw’s own son had retinoblastoma and he was able to detect it after noticing white eye — properly called leukocoria — in a baby photo. The App which was previously only available for iPhone® or iPad has now been released for Android® phones as well. The CRADLE White Eye Detector app can be found on Google Play. The app can automatically look through all the baby pictures on Phone’s camera roll and flag any potential leukocorias, which is important because they tend to show up only inconsistently in photographs. When it finds pictures, it suggests that parents go to their pediatrician. It also requests that they upload the photos to Baylor’s database, so they can be used to continue refining the algorithm. Ideally, the app will learn to be better and better at eliminating false positives that might cause needless worries for patients. An additional feature is a screening mode, which allows the user to shine the phone’s light into someone’s eye and use the camera to search for the telltale white reflection. The free app is a simple to use and an excellent resource for parents to identify the potentially dangerous glow. The app is under clinical review at the Harvard Cancer Institute, and Shaw and his associates are seeking FDA approval to use it as a clinical test in addition to, or perhaps in place of, the more common Red Eye Reflex Test. Shaw believes the free app’s international availability will help people—especially those with little access to health care—detect potential issues early. Why is Carcinogenic Roundup Still Sold in SA?? Nevermind Less Junk Food: Eat More Nutritious Food! Click pic to go to the NCI Dictionary of Cancer Terms ~ a resource with 8,354 easy-to-understand definitions of terms related to cancer and medicine. © Copyright Little Fighters Cancer Trust (LFCT) 2019. All Rights Reserved.